Rose Lake in Hocking Hills, Ohio has skies dark enough to see and photograph the Milkyway. It’s past Milkyway season (yes, there’s a Milkyway season) here in Ohio, but we had a clear moonless night recently and I wasn’t about to waste it. I went specifically to shoot star trails reflected in the mirror-like lake. I setup and composed a shot looking due north just before sunset and waited for the stars to appear. I wanted to include the Northern Star, Polaris, in the photo but didn’t like the light pollution from Logan, Ohio. All the stars appear to revolve around Polaris from our perspective. Here’s some quick trivia: Our best estimate indicates Polaris is 385 light years away. The light I captured on the sensor of my digital camera left the star around the year 1630. Anyway, I reset facing north-east and took sixty 25 second long exposure shots at f/2 and ISO 1600. I shot in portrait orientation to maximize the stars and their reflection. 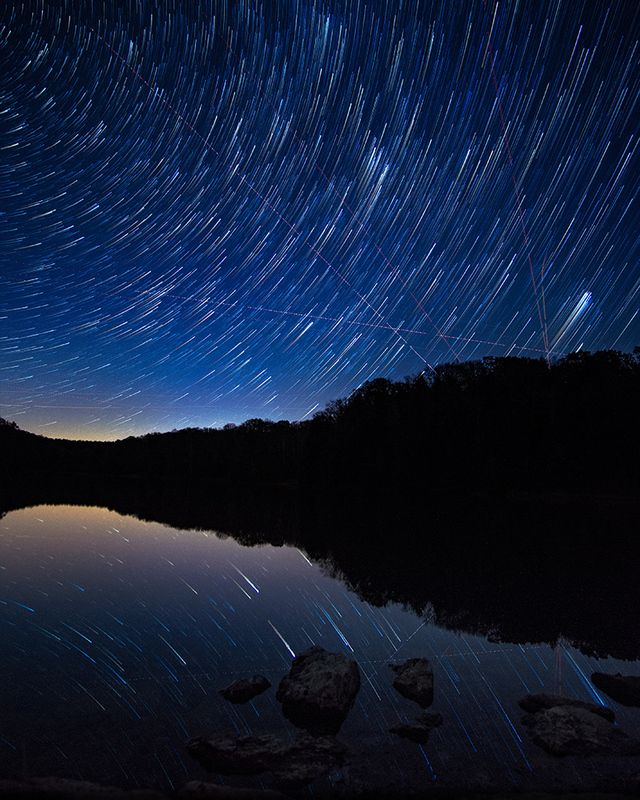 After minor white balance adjustment, these 60 shots were combined using StarStax. I did get to see a couple meteors, but the long trails in the finished photo are planes. The large blob of stars on the right are the Pleiades. I had hoped to shoot a full hour’s worth of rotation, but it got cold enough for frost to be a problem. I’ve since read that you can prevent lens frost with a simple hand warmer and a rubber band. While one camera was shooting star trails in the north, I pointed the other camera south towards the galactic core. The sky over Rose Lake is much darker to the south. Only a portion of the core is visible in November, but it’s still a beautiful site. Ian Norman has just done a great tutorial on lonelyspeck.com on aligning star photos manually so they can be stacked to reduce noise. 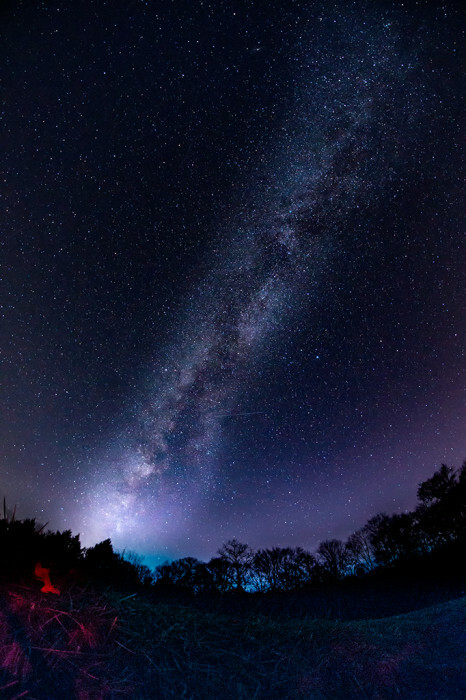 I shot the Milkyway with an 8mm Rokinon fisheye lens. I love shooting the Milkyway with a fisheye lens, but fisheye photos never align correctly using automated algorithms so I was excited to try his method of manual alignment. It’s a little tedious, but it works very well. The finished photo below is eight 20 second exposures at ISO:1600 and f/2.8 . aligned and stacked together. Each pixel is the median value for the eight shots. This removes the random sensor noise created by high ISO and long exposure times. The red leaf in the photo was an accident. I use a red flashlight while shooting at night because it doesn’t effect night vision. I’d turned it on during one of the exposures and lit a small part of the ground. The red lit leaf lined up so well with the Milkyway that I decided to leave it. 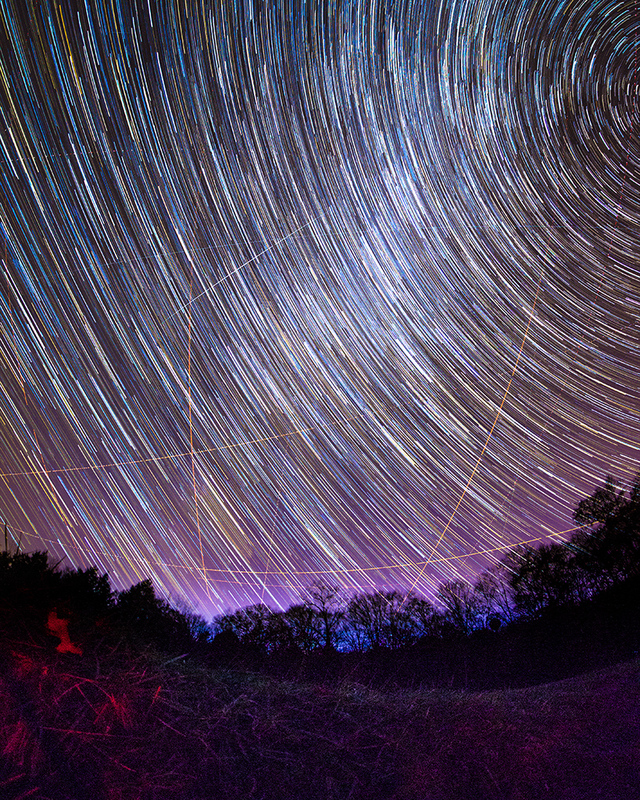 You can make star trail photos from shots of the Milkyway, but to me they’re too much. The individual star trails are lost in a jumble of colors. Rose Lake is a beautiful spot day and night. As the light faded I could hear coyotes and owls. While I was waiting for the cameras to do their thing in the dark, a deer wandered past. I’m pretty sure there were racoons scrounging around too, but I all I could see with the flashlight were the little reflective eyes. It’s a short walk from the Old Man’s Cave Campground maintenance shed to the dam at the south end of the lake. The shed and a couple parking spots are well lit but sit behind trees to the west so the light won’t interfere with night photography. You can find dark sky locations near you using http://www.lightpollutionmap.info and figure out were the stars will be with Stellarium.